Many owners make the mistake of putting their pet/s in a particular place when a storm is happening. Then they reward the dog for being clingy and whimpering. But we don’t want to reward the dog for whimpering because that will increase the clingy behaviour. Instead, practice getting your dog to settle on command. For example, you could try putting a special “inside” leash on the dog and practice having the pet lie at their feet while praising the calm behaviour. 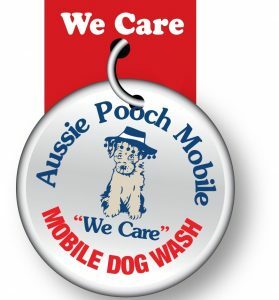 Aussie Pooch Mobile can help with this. Phone: 1300 369 369. Practice this routine when there is no storm so the dog learns the process. Then when the storm comes up the dog knows exactly what to do when you command them, their next actions. During a storm it’s a good idea to try and distract your dog by offering its favourite toy, playing fetch, feeding treats, etc. Just remember only do this if your dog is behaving in a calm manner and following your commands. What you’re trying to do is get them to forget about the storm and replace the fear with something positive. That might mean putting your dog in a basement where the dog can’t hear or see what’s happening outside, an interior room with music playing, or a bathroom. Allow your dog to find his own spot within the areas he is allowed, so that he is comfortable in a storm. Give the dog a safe place where he can go in a storm. In the winter, desensitize your dog to the sounds of a storm. Ask your veterinarian for advice. If your dog still isn’t feeling the best during a storm, you could ask your veterinarian for more ideas to help with behavioural modification. This might include ‘whether medication’ to help with your dogs nervous behavioural problems. Not every dog needs anti-anxiety medication, but dogs that are in a horrible state of high anxiety will really benefit. In severe cases, owners will be required to keep their dogs on the medication for the whole season, while others give their dog medicine in the morning if there’s a chance of a storm later on.